All pet Supplies 5% off with Free shipping Offer! Use Promo code PETS5. Ends March 31, 2017. Buy luxury wooden hangers, enjoy $10 off on orders $100+, free shipping. Code: Hanger10. Ends 3/31/2017. Bizarkdeal.com is a drop ship solution that allows small companies to access thousands of wholesale products directly from their suppliers. With a lower ship, drop price guarantee, and a consolidated product catalog, users can select, customize and add products to their own e-commerce shop. Bizarkdeal.com is a wholesale website to offer wholesale services and drop shipping services at worldwide. Bizarkdeal.com is also a professional drop ship supplier, is in dropship business for years and serving many drop shippers from different countries in the world. 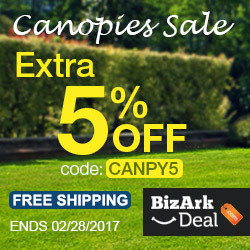 You can always buy Home & Garden, musical instruments, pet supplies, electronics and other quality products at the lowest cost from Bizarkdeal.com. Found a coupon for BizarkDeal?